January - An article in The Times on Monday 24 January explained that a scientist had developed a formula indicating that it was the most depressing day of the year in Britain. They even published the formula based on days after Christmas and the shortest day with the arrival of bills from the Christmas expenditure. The grey days on top of all of this is enough to tip anyone over the edge. We took time out on several weekends to go walking locally in preparation for our holiday in February in Northumberland. Since we removed some cupboards and part of the work surface in the kitchen we've been faced with the dilemma of finding a table that was large enough to make it usable, yet not too large so it's impossible to move around the kitchen. This was just the excuse we needed to take a trip to IKEA Nottingham. We took a risk and went early on a dull, Saturday morning arriving just after opening time. The car park was rapidly filling up but it wasn't too horrendous to get around and we had a really great shop spending far more than we intended to. 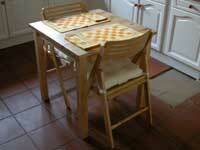 The table and chairs have been a really good buy and we've sat at them to eat on a number of occasions. We now have the problem of finding tiles to fill in the gap where the cupboards used to be - if anyone knows were we can purchase 280mm square Terracotta tiles about 10mm thick then please let us know, we need twelve. On several weekends we managed to get out on some good walks. 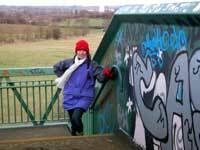 We have a particular walk that takes us from Bugbrooke across the main Birmingham to London Euston railway line - this is Jane standing on the top of the bridge. The walk then crosses the A5 (Watling Street) up to Upper Stow and sometimes we visit Martin in The Small Plaice Gallery at The Dairy Farm Centre. After a quick coffee we then take the road down to Nether Heyford calling in on Kate at the boat moored on the Grand Union canal before following the canal towpath back to Bugbrooke. On another occasion we walked from home into Northampton with a stopover at Sue & Graham's for a refreshing cup of tea before heading back home - we found that one quite tiring. On the way back we met a chap with an enormous telephoto lens who was hoping to photograph short eared owls in flight. We stopped and chatted for a while but didn't see anything remotely interesting. With Jane's birthday rapidly approaching in February Steve has been racking his brains for something that Jane really wanted. 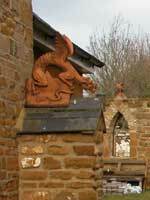 Then in a rare moment of inspiration he came up with the idea of buying her one of the dragon sculptured ridge tiles that she'd seen at the Weedon Antiques centre. With real panache Steve then suggests buying two so that we can have one either side of the gates. It was interesting to learn that they are not old but recently produced from limited moulds and then aged so they look as though they are original Victorian ridge tiles. A short drive to Weedon and the deal was done. We've put them up onto the gate post walls but they are not properly fixed and we think we need to fix them properly so that they're not just sitting on top of the existing ridge tiles. For the icing on the cake Steve has this idea of putting in some lighting from below which comes on when someone comes into the drive. They look really good when the cars headlights pick them out as we enter the drive. All in the same week the TV in the library ceased to function and the central heating broke down. The TV wasn't a problem because we moved the one from the summer room down into the library. The replacement TV was bought second hand from Granada Rentals back in 1994 so it probably wasn't going to last long so we decided to bite the bullet and buy a large screen TV. We looked at a large number most of them had silver coloured surrounds and we both agreed that a black surround gave the impression of a better picture. Eventually we settled on this box, reduced by £200 so it was also a bargain. 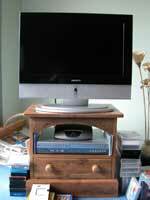 The picture is brilliant and Steve keeps walking into the room and stops in amazement at the brightness and the clarity particularly on digital TV or when playing a DVD. This is like having a home cinema. The heating issue wasn't too much hassle either because Steve recognised the fault as the motorised valve and just happened to have a spare in the barn. Ten minutes after finding it - yes it was exactly where he thought it should be he had the heating back up and working. We guess that fetching a plumber out in the evening to do this simple job would've cost in the region of £200 - another saving. We went to see The Aviator early in the month. This is the story of a small part of Howard Hugh's life. It doesn't go as far as his declining years when he became a complete recluse with extreme obsessive compulsive disorder but it does give some insight into this when he won't cut his hair or fingernails and stores his urine in milk bottles. Neither of us are enamoured with Leonardo DiCaprio but he acted the part brilliantly and carried the film. Howard Hughes was a genius. He helped to design and build some beautiful aircraft that were at the cutting edge of aviation. His films were produced and edited to perfection at great expense. It's a wonder he didn't bankrupt the company that he inherited from his parents but somehow he managed to retain his millions. We weren't sure about going to see Closer but the Orange Wednesday offer is just too tempting - this is a deal for Orange mobile phone users who get a free cinema ticket (buy one get one free) every Wednesday. It turned out to be a finely acted story of relationships of people in their thirties who cannot make a commitment or make compromises sufficiently to make a relationship work. This is about people who haven't the maturity to realise that although we live in a material world you cannot have it all. We possibly enjoyed this film in a smug way, knowing that we had life sorted and the characters in this film didn't. Jane has been a real theatre buff this month. 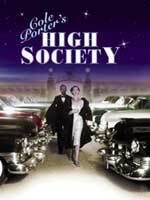 She and her friend Alison went to see High Society at the Derngate Theatre in Northampton. We had Jane's mother staying so Alison came round for a pre theatre dinner and after Steve chauffeured them into Northampton, sat with Mother-in-law, or to be more honest, sat at his computer playing Half-Life2. Jane just loves the Cole Porter songs and if there's a hint of tap dancing then she has just got to be there. They both came out humming tunes and tripping the light fantastic as they headed towards the car. If it wasn't for the onset of arthritic hips and ankles she would still be going to tap dancing classes. On the last day of the month we went to the Derngate Theatre in Northampton to see Stones in his Pockets. The tickets were a Christmas present from Deirdre, our next door neighbour. It is a strange production with only two actors playing all the parts. There is very little story, with light humour and an element of pathos. It didn't work for Steve and he struggled to stay awake after a busy day at work. It wasn't helped by the fact that the theatre was just too large for such a subtle play. Jane enjoyed the experience, stayed awake for most of the time, and for those who know her, will realise how exceptional that is.